Surrounded by the internationally significant World Heritage national park of Kakadu you will witness the countless centuries of human endeavour carefully recorded on this ancient landscape. Meet the present-day traditional owners of Kakadu National Park. Hear their stories of creation, feel their love for the country and understand some of the issues. Featuring Ubirr, Nourlangie, Anbanbang Billabong, Warradjan Culture centre, Bowali centre and including local indigenous guides and cruises. An early morning start gets us out to greet the sunrise on the dynamic Adelaide River floodplains. On display here is a massive variety of birdlife, reptiles, mammals and more across wetlands, floodplains, woodlands and monsoonal forest. Enjoy breakfast with the birds and coffee with the critters! Moving on, our destiny takes us to Jabiru in the heart of World Heritage Kakadu National Park. Our first stop will be the Bowali centre for an introduction to the Kakadu environmental and indigenous landscape as well as a fresh picnic lunch. After lunch it is time for a birds eye view of Kakadu from a light aircraft. This is all about perspective. From there we venture to the iconic East Alligator River and join the award winning Guluyambi Culture Cruise for 90 minutes of wildlife spotting, indigenous culture instructions and anecdotes from a local aboriginal guide. Bare in mind to keep your hands in the boat as this river has one of the highest populations of estuarine crocodiles in the world. For those that survive the cruise it is time for a stroll amongst the ancient rock art of Ubirr culminating with sunset nibbles and refreshments at Nadab lookout overlooking the eternal Kakadu floodplains. Accommodation tonight is a Suite room at Anbinik Resort. Up before the birds, a quick cuppa and we are off to Cooinda where we join the world-renowned sunrise Yellow Waters cruise. This is the perfect cruise to witness the wakening of wildlife on the wetlands backed up by expert local commentary. Enjoy the full buffet breakfast at Cooinda resort after the cruise before spending some quality time in the comprehensive aboriginal culture centre, Warradjan. Featuring stories, images, crafts, art and much more Warradjan is a place to go quietly and slowly. Absorb the knowledge and then sit down with female elders and learn the craft of string making and weaving afterwards. Following this we journey towards Anbangbang Billabong and Nourlangie. Both Anbangbang and Nourlangie are rich in natural values and are significant spiritual places for the local indigenous peoples. For such an occasion and location, you will be privately guided through the halls of time by a local indigenous guide. Ask those questions and ponder the answers. With a late lunch following the walk by Nourlangie we are set for arrival back in Darwin around 7:30pm. Please note that the itinerary is subject to environmental and cultural considerations which may affect it on the day. We reserve the right to make changes and omisisons without notice. Comfortable hiking/walking shoes ( no flip flops! ). Sandles are OK. The less luggage you take the better. This makes it much easier for us to get around. However we do understand that this isn't always possible and so as a rule of thumb we restrict luggage to approx 10-15kg. If you think that you will be over this amount please let us know at the time of your booking and exceptions can be arranged. Where can I store my luggage whilst on tour? During the tour your main luggage will be stored in our trailer. This trailer is always locked however we cannot guarantee the complete safety of your gear from theft or damage. This is why it is so important to purchase a good travel insurance. If you need to store your luggage whilst away on tour, this can be done through your accommodation. Most hostel and hotels will store your luggage safely free of charge. Will I be able to do any laundry whilst on tour? Generally you will not have enough time to do laundry whilst on tour. You will be having far too much fun! However, for longer tours heading towards Adelaide involving hostel style accommodation you may have the opportunity to wash your clothes if really need. Please enquire by contact us directly via email or phone. For all camping tours in the Northern Territory you will need a sleeping bag. The Northern Territory can get very cold at night, especially during the months of June and July. If you don't have one then they are available for hire. Please refer to the "What to bring" section of the tour page for pricing. Can I get online whilst travelling? For tours incorporating hostel/hotel style accommodation you may have the opportunity to use wireless internet or use of nearby internet cafe. This will vary from tour to tour so please contact us directly for more accurate information. For camping tours internet will not be available. Can I just do a section of this tour and not the whole trip? Unfortunately it is not possible to only do a part of the tour. 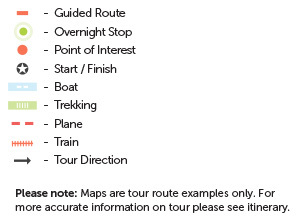 Passengers generally need to stay with the tour from start to finish. However, drop off locations at the end of the tour made me negotiated. If I make a deposit only, when will I need to pay the balance? Balance on tours need to be paid at least 30 days prior to departure. Failure to do so could result is the cancellation of your seat with a fee charged. If you need more time to clear your balance then let us know ASAP and arrangements can be made. How many people will be on tour? Group sizes vary from tour to tour. You can find the size of your group by checking out information at the top right hand corner of the tour page. Group sizes range of 5 - 24 people. Not really. The centre of Australia is quite dry and there is very few places where we are allowed to swim. However, for tours heading upwards towards Darwin there may be areas for swimming. If you aren't able to swim then you don't need to go into the water. In many cases there may be shallow areas when you can still get wet without having to actually swim. Please contact us for more information. What does "Paid Locally" mean? Some tours require you to pay national park fees directly, in cash, to the tour guide on the morning of departure. Rest assured this will be subtracted from the tour price when reserving your tour. What type of tent will I get? Tents are generally designed to accommodate a minimum of 2 people. This means there is plenty of room to move about and store your luggage. However, most Uluru tours we try and encourage the use of swags and mattress rather than tents. This is the ideal way to camp in the centre of Australia; Around a campfire, under the stars! What are the sleeping arrangements in Kakadu? Most of our tours to Kakadu National park involve a camping. However, for those tours heading towards Alice Springs and beyond, there will also be hostel style accommodation. Tents are generally designed to accommodate a minimum of 2 people. This means there is plenty of room to move about and store your luggage. Depending on which Kakadu tour you chose you may be required to set your tent up at the end of the day otherwise our campsites are permanent and are ready to go! Campsites in Kakadu come with basic facilities such as toilets and sometimes showers. Our emphasis is on fresh food wherever possible and our meals are nutritious and varied on these Uluru tours. If you are vegetarian or gluten intolerant we can cater for you, but if you have very specific dietary needs you may need to provide your own food, please discuss this at time of booking. For breakfast we supply cereals, fruits, toast, tea and coffee. Lunch is usually a self-serve sandwich and salads; in the evening we have a cooked dinner. We always carry water in the vehicle and you will often have the chance to buy your own drinks, ice-creams etc at stops. Please refer to each individual tour/package to establish which meals are included. Can you cater of special diets? We can certain cater for most dietary needs. Please advise us at the time of your booking so arrangements can be made. For travellers with more extreme diets we may ask that you bring along additional snacks. What vehicles do we use whilst in Kakadu? For our Kakadu Tours we toss between a Troop Carrier 4WD Landcruise, 4WD Canter or a custom prepared mini bus. This depends on the size of the group and the amount of days we are out in the park. Each Kakadu tour varies so please refer to your tour info panel on the top right hand side of the page. Is there any long periods of driving? The initial drive out to Kakadu can be quite long. In total its almost 300km to the park border. But don't worry! We stop along the way to check out a few attractions and we also visit the Bark Hut Inn where you can stretch and grab some refreshments. All up it takes a couple of hours driving to reach Kakadu but the time will go much quicker than you think! The country side is amazing. What is the weather like in Kakadu? For the most up to date weather forecast please check our weather snippet at the trip over section on the top right hand corner. We are in total agreement with all the glowing reviews one reads here. Spending a day or two with Rob islike driving around with an old friend who cares about the environment and is committed to protecting it. It was an intimate and personal experience with discussions ranging from local lore to environmental protection to our families. The home cooked food, nutritious and delicious,was a welcome relief from the typical travelers fare. We were sad to have it come to an end.